This year – yes, disgracefully so – it’s my first blog of 2013 – I’m into feeling, which means that if I feel like doing something related to pushing my taste buds further, then I’m going to do it. So, here we are. Salted Caramel Espresso ??? Did I arrive at this because I found this wonderfully unusual coffee, roasted by a supremo and brewed it in an unusual way ? NO! Simply, I manipulated one of the major elements of the espresso brewing process. BUT, first up, a little about the raw ingredient – the coffee itself – Shakisso from the Sidamo Region of Ethiopia, from the 2011-2012 season, grown at 1800m above sea level, organically grown and sun-dried on raised beds, shipped in grain pro bags (???). Who was the roaster ? 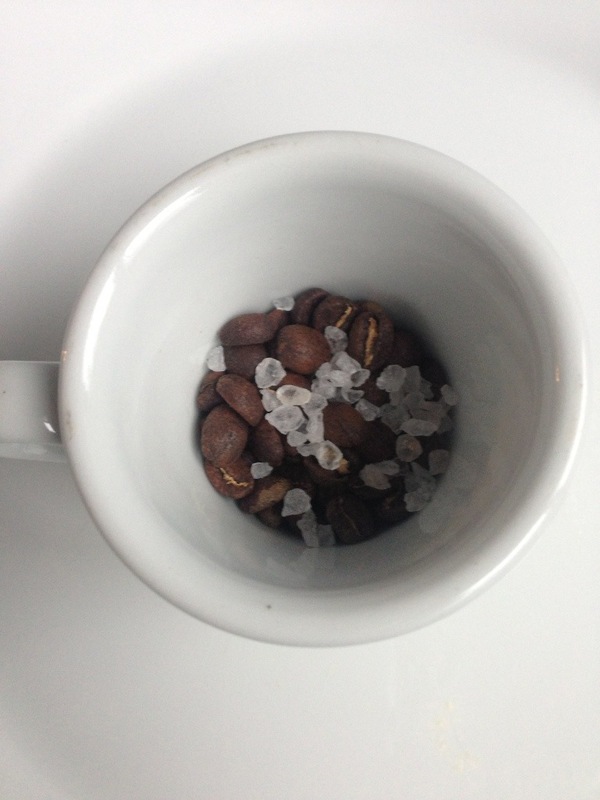 Espresso Lab, Cape Town and how did the roaster describe the taste ? floral, silky body, soft chocolate, honey, jasmine, stone fruit, sweet lemonade and tangerine – quite a mouthful and quite a wide range of tastes. Now! that might seem delectable to some readers, but the main reason I bought the coffee was because I trusted the roaster and not because of the taste profile, because based on past experience, if you don’t have a very developed palate and extra-ordinary attention to detail in preparing coffee, using the best – yep! the best tools, then there’s no way you are going to experience some of those wonderful taste profiles described by this or any other skilled roaster. Where am I going with this ? Well! What do I feel like tasting when I buy coffee – something special all the time. I never buy coffee for the sake of buying coffee. I buy coffee from trusted roasters and I don’t mean Illy or Lavazza. I mean people who spend time roasting with passion. BUT, I do have some taste preference when it comes to coffee – I love caramel, cocoa, dark chocolate, hints of milk chocolate, toffee, butter toffee (typical of Square Mile Coffee) , silky smooth wrap around yout tongue, vanilla, maple syrup, honey, pecan, praline, roasted cashew (organic Ugandan I once had), grapefruit acidity and probably more that I haven’t developed yet and of course SALTED CARAMEL. So what did I manipulate ? Just the water. I added a few drops (say quarter of a teaspoon) of Himalayan Pink Salt into the water tank before I brewed my espresso – that’s it and wow, what a delight for my taste buds. If you like something and people always tell you, don’t do it, it’s not right, at least give a shot once and you may not regret it and if you do, at least you experience something different, right ?